What event actions are and a list of which actions are available. Intro to options visitors have to share and promote your events. Control action options in spud views and the event actions window. Promote interactions by sending visitors to event and calendar action pages. Let visitors use Disqus or Facebook to comment on events and objects. How to hide event actions in calendar and event detail views. Visitors can print events but results vary with page layout and browser settings. What it means to subscribe to a calendar by email or through a feed. How to cancel the default weekly email or disable the public subscribe option. Control date range, number of events, and custom fields included in feeds. How to hide calendar actions in calendar views. Description of Event Actions and how it improves the event actions experience. Why you should offer visitor accounts and how they work. How publishers with admin privileges control the way the web app works and looks. Calendar and event actions Help topic that you can link to or copy content from. Trumba® calendars are interactive. Calendar visitors have lots of opportunity to take actions on both a calendar and individual event level. For example, visitors can subscribe to your calendar to receive weekly email updates or new event notifications through RSS and other feeds. They can also easily add events to their personal calendars, set up event reminders, post events to Facebook and Twitter, and even comment on events using the Facebook comments plugin. You can control which actions are available in both the main calendar and event detail views. Visitors who view this event detail can click links and buttons to easily post the event to Facebook and Twitter, add the event to their personal calendars, forward the event to friends, and more. 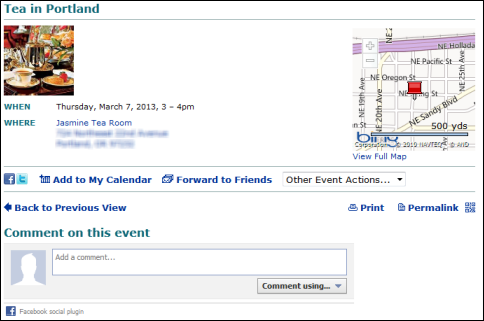 They can also use the Facebook comments plugin to comment on the event and post the comments to their Facebook timelines.